One game of cricket. Five all-time greats. A battle for the ages. Greg Chappell, Viv Richards, Jeff Thomson, Rod Marsh and Dennis Lillee the best of the best in international cricket in the 1970s. Imagine a match that pitted them against each other; imagine The Miracle Match. In 1976, Western Australia took on Queensland in a one-day domestic at the WACA Ground it would come to be known as The Miracle Match. The stakes were high: a chance to play in the final of Australia’s one-day competition. Western Australia, the first team to bat, was out for just 77 runs. Defeat seemed a certainty, but what happened next had the crowd of 10,000 on the edges of their seats. “Make ‘em fight for it, be buggered ... we’re going to beat these bastards!” said Western Australia’s demon fast-bowler Dennis Lillee, before spearheading an attack that claimed Viv Richards and Greg Chappell for just two runs between them. 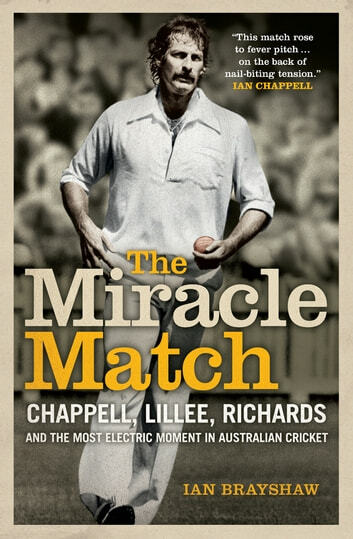 Author Ian Brayshaw, a player in The Miracle Match, takes us through one of the most electric games in Australian cricket history and gives us a fascinating insight into the careers of some of cricket’s most successful and influential players. The Miracle Match, a nostalgic look at international cricket in the 1970s, will enthral cricket fans young and old. Remember watching the game on TV as a boy. Enthralled that WA had a chance of winning as the wickets fell. Was great to read about it. Interesting read for cricket fans.